Roof cleaning equipment is specially designed for service professionals, custom built and calibrated with quality components. Enables Authorized Roof-A-Cide ® Applicators to efficiently clean and safely treat all asphalt shingle, stone coated steel, slate, concrete, barrel or clay tile roof. Roof cleaning equipment, features a high volume, chemical pump with pressure regulator. System delivers a gentle spray for the safe application of Roof Restore® cleaner, HVLP rinse and Roof-A-Cide® algaecide/stain treatments. Compact system will reduce technician time on roof and saves on labor costs. Equipment can be customized and installed on your trailer, enclosed van or truck. Easy to modify, upgrade or build your own to required specifications. 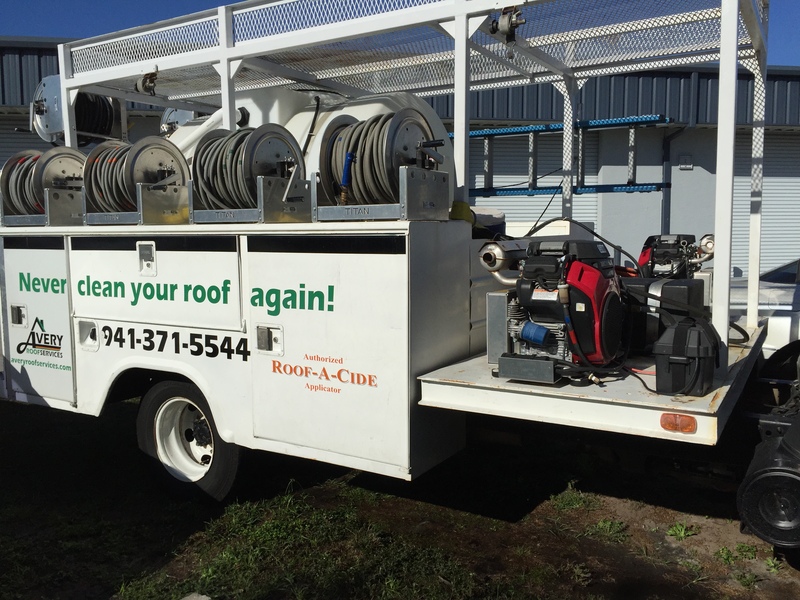 Advanced Roofing and Sheet Metal – (Advanced Cleaning Solutions) in Ft. Myers, Fl displays company information and services signs on open wheel tandem trailers for their roof cleaning and Roof-A-Cide® algae/stain treatments. In case of a vehicle breakdown a trailer can be attached to another vehicle quickly to continue operations with minimal delay. Trailer can also be detached and left on job site. 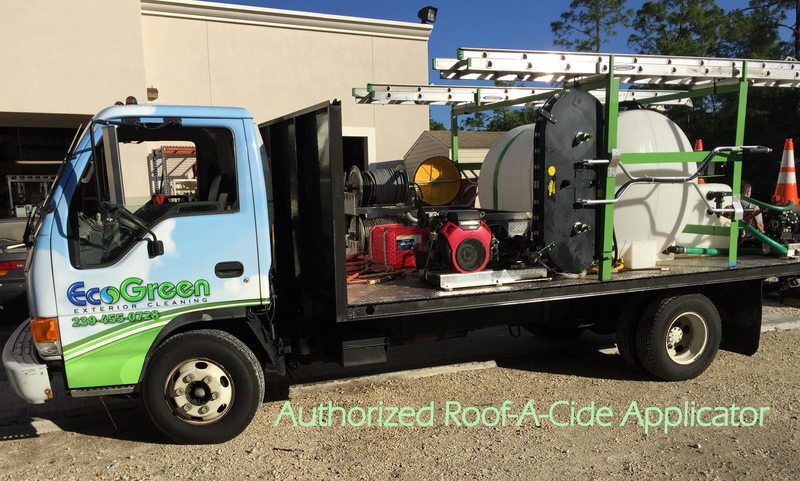 Hoover Pressure Cleaning in Northport, Florida added a new enclosed truck to their fleet with company contact information on all sides; residential and commercial pressure cleaning, safe roof cleaning and Roof-A-Cide® algae/stain treatments. A secure work platform when an open trailer is not an option. 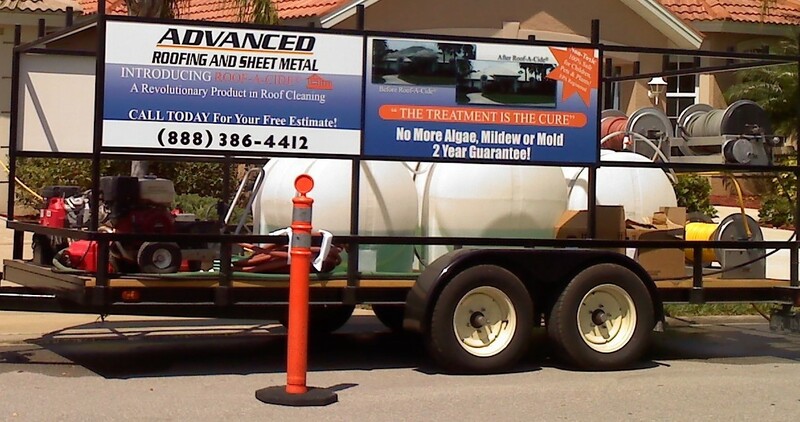 Hoover Pressure Cleaning service truck and trailer combination. 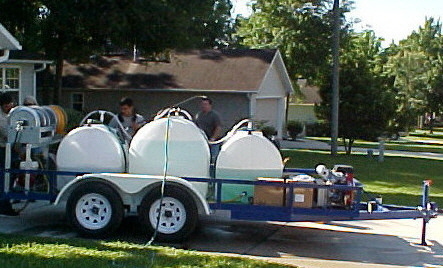 Perry Roofing in Gainesville, Florida supplied a custom built trailer for fitment of spray equipment. A fabricator and parts supplier installed standard and additional equipment including, two pressure washers, extra length hoses and motorized hose reels. Ladder and storage racks were fitted at a later date. 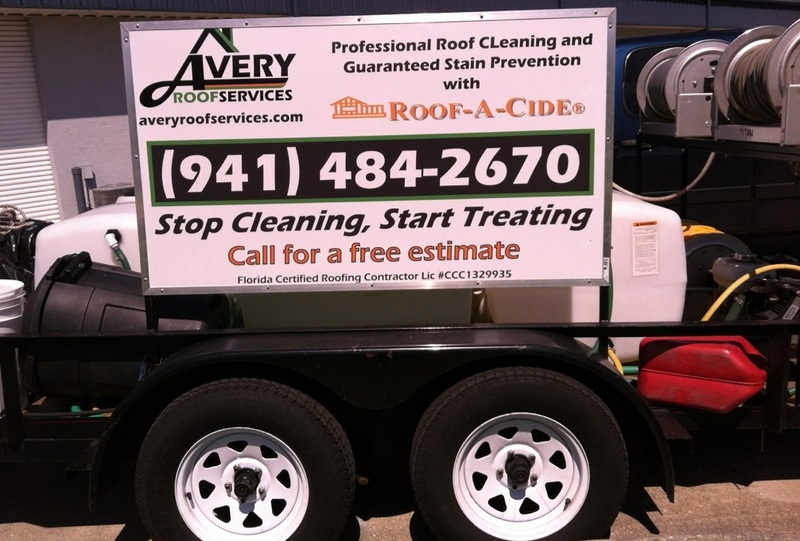 Avery Roof Services of Sarasota, FL has a new service truck set up for a final roof cleaning and Roof-A-Cide® Treatment. A well designed system for efficient operation by their trained technicians. Multiple pumps, hose reels, easy access tool, ladder racks and chemical storage compartments and large water tank. Eco Green Exterior Cleaning utilizes several vehicle types for applicator services. All Authorized Roof-A-Cide® Applicators are licensed and professionally trained and equipped to service all residential or commercial customers.